Note: I did not intend to buy any books last week, but I came across so many interesting ones that I broke the promise and as a result my TBR stack has once again swelled to over 800 books. Oh, well, at least they were cheap. I had read two, or possibly three, of them before. I read a lot af Agatha Christie novels in my teens and I can't be sure if I have read some of them until I reread them, and sometimes not even then. They are Hickory Dickory Dock, The Body in the Library and Postern of Fate. I bought them because it suddenly occurred to me that I would quite like to own all of her mystery novels. 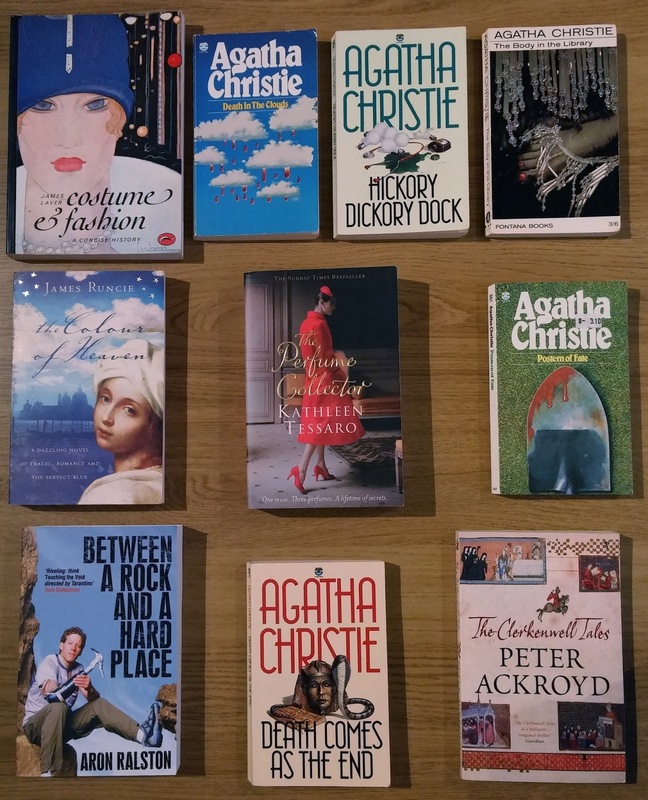 I'm pretty sure I haven't read Death in the Clouds before, and I know I haven't read Death Comes as the End, which I intend to remedy soon, since it seems to be on a number of lists of Christie's best novels. I am just about ready to forgive Peter Ackroyd for the bloated mess that was the second half of London: The Biography, and The Clerkenwell Letters looks too short to be bloated. I have an interest in costume history and have several books on the subject. Costume & Fashion looks like a good addition to the collection, and it has lots of pictures. The Colour of Heaven and The Perfume Collector looked interesting, but it remains to be seen whether I read them or not. If you have a suggestion as to which of these books I should tackle first, please leave a comment with your recommendation. Note: I will be in Denmark until Sunday and any comments will not become visible until I get back and approve them.